One difficulty that people face with the Phoenix scenario outlined in the previous chapters is the question of role. It’s not unusual to look at the scenario and its corresponding plays such as “pig in a poke” and ask what happens to the people? A common retort is “leadership is all about people and the leader should sacrifice themselves for their people”. It’s a noble idea. As difficult as it is, you have to remember that in the scenario you are an executive of the conglomerate and your focus is on maximising its advantage. The game is somewhat different if you’re the CEO of the subsidiary. That which brings maximum advantage for one perspective is not necessarily that which brings the maximum benefit for another. There are often many competing interest and many maxima in a single landscape. Whilst the game itself is rarely zero sum (i.e. if I win then you lose or vice versa) as both competitors can often benefit through collaboration, your focus should be on maximising your advantage. The pursuit of such will result in conflict whether it’s with your competitors or the conflict between the shareholders desire for profit versus the consumers desire for lower product cost. There is always some other trade off if you look hard enough. When you examine a map, you need to go beyond just the landscape, the why of movement (i.e. this choice over that), the why of purpose (to be this or that) and to consider your role and that of others. There are many actors in a map and they have different perspectives. Even the consumer’s view of the landscape can be different from that of the producer. Mapping simply shows you a landscape, you have to apply thought, you have to balance conflicts and you have to strive for your maximum advantage. But isn’t this cold hearted? Aren’t you treating people and that means real lives as dots on a canvas? Yes, it can be dispassionate. But remember, you also have to lead and that requires trust from others. There is a cost associated with brutal corporate action through loss of trust. Which brings us to another trade off as you have to balance present action versus future. Become known as being too Machiavellian, too brutal and your reward will be that too few will follow you. Seeking the path with least conflict, to win the war without fighting and to demonstrate how all can benefit is the pinnacle of the craft of war. Balancing these conflicts, focusing on your role, removing your own bias and understanding the different maxima that exist is one of the hardest challenges that I know for leadership. Without maps it’s almost impossible to make sense of this in an unseen landscape. Hence we just fall back to gut feel and notions of “it seems the right thing to do”. The practices of mapping are the trivial entry point into this world as the simply expose it rather than solve. The complexity of playing the game is vastly more than just seeing the board, knowing the rules and a few opening plays. I often suspect this is why we relish story-telling, magic frameworks such as 2x2s and secrets of success in management. We paper over a complex world with simple to understand “truths” regardless of how incorrect they are because it makes management easier and gives us a sense of control. To tease out the concept of role, I’m going to use a generalised scenario that has two variants — one which covers product to product substitution and the other which covers product to utility. 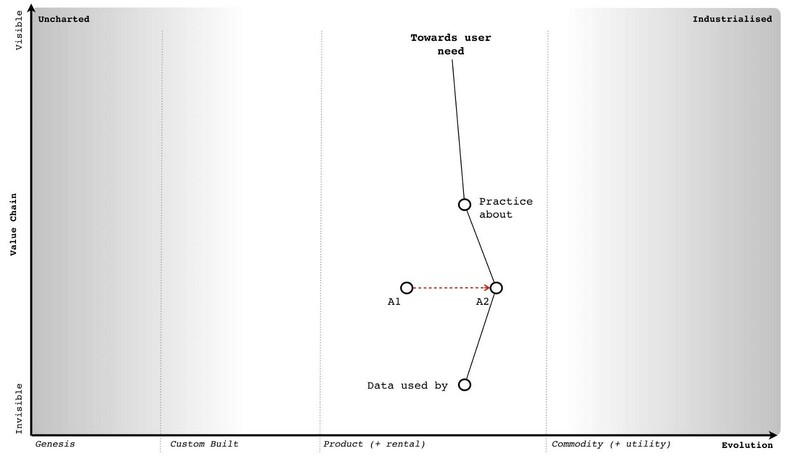 I’ll use a single map to describe both and I’m going to focus on the pattern of change from product to utility rather than user needs. You should be familiar enough with mapping by now that such shortcuts are permissible. You are the founder / CEO of a company that produces a product. You’ve developed a successful business. You are proud of what you have accomplished and the team you have built. In one variant, your product (point A1) is being substituted by another product (A1 to A2) e.g. Blackberry vs Android. In the other variant your product is being substituted by a utility (A1 to A3) e.g. traditional hosting versus cloud computing. I’ve drawn these variants on a single map in figure 188. In any business relationship, there are more than just products involved. 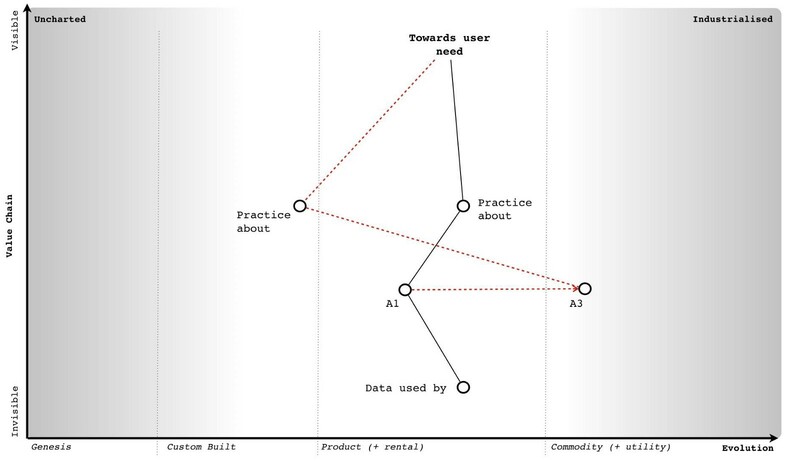 There is the practice of how the product is used, data about the product, data consumed by the product and even knowledge about the construction of the product. I’ve marked examples of this onto figure 189 for our product. How do I know I’ve put the dots in the right place? I don’t. Maps can be tools for explaining general concepts and in this case, I will just assume that the practice around how to use our product is well developed along with the data that underpins it. Now, let us consider the first variant where our product is undergoing substitution from A1 to A2. We are RIM, our flagship Blackberry product is under assault from a range of new Android phones that have appeared on the market. With such substitutions then the existing data, practice and knowledge of the market tends to be maintained i.e. an Android phone might substitute the Blackberry but the practice of using smartphones, the data around the market and even knowledge about construction & use will tend to incrementally improve rather than be substituted itself. I’ve marked this change onto figure 190. Unsurprisingly, we are going to have inertia to this change. A significant source of this will be our own past success often represented by our own sales data, our own marketing collateral and our own reward systems. These systems will encourage us to believe that the change won’t happen and with good reason. Such product to product substitutions are highly unpredictable. Whilst it is easy to look back in hindsight and describe the success of the iPhone, there was no guarantee that the iPhone would succeed disrupt the existing market. In fact, the guru of disruption Clayton Christensen stated that the iPhone would fail. As the CEO of a company facing a potential substitution then my understanding of this change provides me with options. The most common of which is known as Charles Handy’s 2nd Curve or in other words, the exploitation of an existing position in order to create a future position. This second curve works because substitution doesn’t happen overnight. We don’t wake up one morning and discover that the entire world has changed. There is still value to be extracted from the “legacy” position before any crisis point is reached. I can use this time and any revenue created from the legacy to invest in and leapfrog our competitors by building a better or adjacent product that exploits the change in the market. I could even employ a more radical shift or some combination of any of the above with concepts of differentiation. Since the practice around the activity is unlikely to change then I also have the skills, experience, knowledge, brand (another form of capital), process and data within my company to play this game. I might not however have the culture and there is still any internal inertia to overcome, so it’s not a trivial problem. As a founder CEO, my tendency will often be towards the fight. Words such as “I’ve built this company, I want to succeed and I want to create a glorious future for my people” are not uncommon. In this context then I can create a vision that builds upon our past practice and experience, I can sell a purpose of creating a new future and explain why we need to make this change. There’s never any guarantee to success but as long as I’ve seen the change and react quickly enough then I can often overcome it. This does require a strong will, fast action and a willingness to gamble because product substitutions are unpredictable and you can’t plan for this uncertain change in advance. 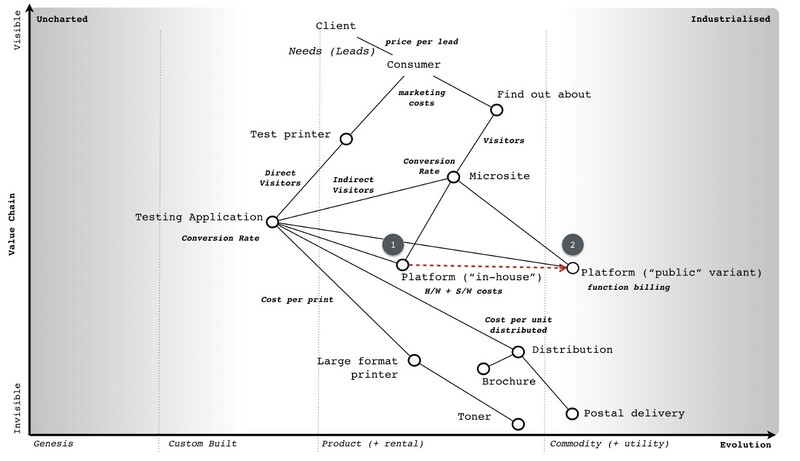 I’ve given an idealised example of this in figure 192 using the concept of leapfrogging a competitor. Let us now change our role into that of a hedge fund manager. In this case, I’m left with a bit of quandary. We’ve seen the appearance of a product that might substitute the company’s but there is no guarantee that it will. This means that I don’t know which company to invest in for the future, it’s a gamble. Also, if the CEO of the company being substituted is switched on then they might play a comeback with a second curve and a new product. Apple is one of those companies that has successfully played a second curve several times bringing us new products from the iPod to the iPhone to the iPad. A lot depends upon my confidence with the CEO and whether they have done this before. My tendency would be to hedge my bets here and closely monitor. Here we have two distinct roles, that of CEO (and the options you might play) and that of the hedge fund manager. However, the desire of the founder CEO to create a future for their company can be easily aligned with the desires of the hedge fund manager. There might be tension but there’s no real conflict between the roles. Whether the two views are aligned is often more a question of confidence and whether the right culture exists. Let us now play this scenario again and consider the second variant and the substitution of the company’s product by a utility (e.g. A1 to A3). Along with inertia, there are a number of complications caused by common economic patterns. The first complication is caused by co-evolution of practice. As with more recent examples (e.g. cloud computing and the rise of DevOps) then the changing characteristics of the activity as it evolves from product to utility will result in co-evolved practices. This will also apply to any data and knowledge of the space. I’ve marked this change in figure 193 focusing in on practice. It’s not enough to simply react to the change of activity, we have to understand that the entire practice and associated components will also change. The second complication is that changes from product to utility tends to exhibit a punctuated equilibrium (a rapid period of change), so we have to deal with not only legacy in product but legacy in skill-sets and cope with this in double quick time. The third complication is the “legacy” practices, data and knowledge will significantly reinforce inertia to the change at a time when change is rapid. This doesn’t help me to adapt nor give me much time to exploit the legacy but alas it’s far worse than that. My ability to perceive the crisis point will be diminished by the statements of confidence in the current way despite the simple fact that in this case, the shift from product to utility is anticipatable in advance. As the CEO you will be told from all directions why this change won’t happen, your sales team will tell you this, your own engineers are likely to say this and even your customers. Despite the inevitability of the change, you are given every reason to believe that it won’t happen. The same happened in cloud and it has happened many times before. In a short period of time, we will have a change of activity, a change of practice and three major sources of inertia to contend with. Our past sales data, the change of practice itself (which will be resisted by our own people) and the impact of a change of practice on our customers (they will also tend to resist) will try to dull our senses and demand we stay put. I’ve marked these sources of inertia onto figure 194. Figure 194 — three points of inertia. But, it’s even worse than this. Not only do you have to overcome multiple sources of inertia but the fourth complication is your choice of direction is far more limited in scope. Beyond niche specialisation, there is no product option in a utility world. You can try to substitute the competitor’s utility with your own but this is a very difficult game especially if you don’t have the skill-sets and the capability to do this. If you’re dominated by legacy practice, data and knowledge then it is highly unlikely that you will have that capability. Any alternative path you wish to introduce will need to be far more radical. You might think that companies can play a second curve in this position and build a future whilst exploiting the past but the mechanics are so different, the practices so alien and situational awareness often so poor that the crisis point is usually upon them when most are still debating if there even might be a future crisis point. To compound this, they have none of what they need — none of the practice, none of the data and none of the knowledge. However, let us assume that you’re a canny CEO and you know these problems. Your desire is still to build that glorious future. You want to play the second curve game and understand there is limited opportunity in the utility space as you’re late to the party. Instead, you’re going to create a radical new future. You’ll have to completely reinvent a “successful” company with not only a new set of uncertain activities but also a new set of uncertain practices. This is about as radical as it gets, it’s an enormous gamble even as a startup but you’ll be trying to do this with an existing company with a legacy business that not only wants to fight you every step of the way but few will understand why you are embarking on this route. Talk about the Augean stables, this is not going to be an easy or pleasant task. This doesn’t mean it cannot be done but the level of situational awareness and gameplay required are off the charts. There’s a long history of CEOs trying to implement radical and poorly understood changes being ousted by boards. 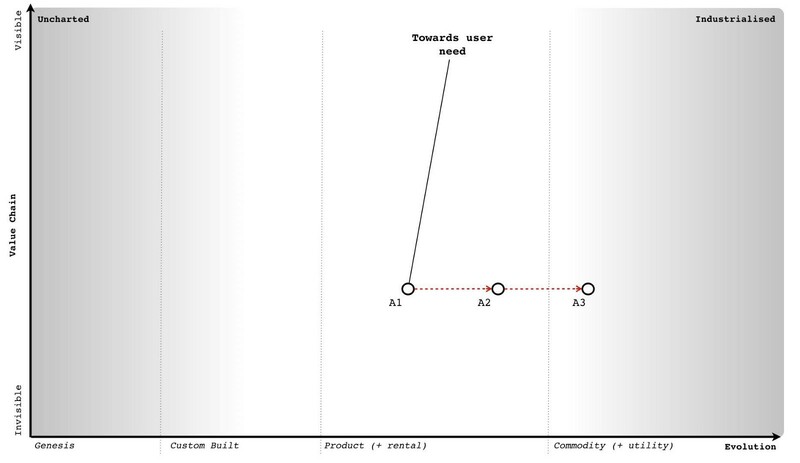 I’ve seen numerous successful examples of the second curve played out in product to product substitution but by the same measure I’ve seen as many second curve failures played out in a product to a utility world. All the past giants of computing infrastructure that tried to play a second curve game against the new cloud entrants have failed with the possible exception of Microsoft. But then, Microsoft wasn’t a hardware company under direct assault and it had more space to play the game in. Of course, it doesn’t have to be this way. This form of change, the substitution from product to utility, can be anticipated well in advance and there is no reason a company should find itself in that position. Naturally, almost all companies fail anticipate it because they lack any form of situational awareness or mechanism of systemic learning. Most don’t understand basic economic patterns and hence fail to anticipate and prepare for them. Whether this is fortunate or unfortunate is a question of your perspective. However, let us assume that your company faces this dreadful position of being substituted by a utility but you are Queen Boudica, the warrior leader, the stuff that legends are made of and you won’t give up the fight. Well, it’s not only your company, your staff and your customers who are going to fight you in your pursuit of a better future — it’s also the financial markets. To explain why, let us one again switch to the role of the hedge fund manager. To begin, let us focus for a moment on cloud computing. It represents a timely expression of this form of product to utility substitution with a rapid period of change and co-evolved practices that were all highly anticipatable. At the same time this is occurring, there is also a significant legacy of activities and practice. So, ask yourself the question of where do you invest? The immediate response tends to be — “in the cloud space” — because that’s now seen as the future. But this wasn’t the case in 2008. There was still lots of uncertainty in the market due to poor situational awareness despite the change being highly anticipatable. Let us assume that you are that rare beast, a hedge fund manager with a good helping of situational awareness. You don’t tend to be caught unawares by highly anticipatable changes. You’re not the sort of person who lets go of the glass of wine and complains in surprise that it fell to the ground rather than levitated through the magic of thought leadership. You know that there are precise and meaningful patterns in life and incantations of “ecosystem, innovation, platform, abracadabra” don’t actually work. In this case, you will understand that for you then longer term capital gains will be made by investing in that future focused space i.e. those utility providers. However, you’re a canny sort and know this is only part of the story. There is also the potential for shorter term benefits as companies provide services to those with legacy activities and practice. As the hedge fund manager you should be aware that the legacy will eventually diminish but there exists money now. Any short term benefit depends upon those companies operating in the legacy space focusing on returning capital to shareholders. To maximise my advantage, I’d be looking to invest in the long term capital gains from those developing the future industry but at the same time reap short term benefits (in terms of dividends) from those extracting value from legacy. However, I’m assuming that the CEOs playing in the legacy space know their role. The ideal situation is a CEO that is sweating legacy business models to return value to shareholders often combined with acquisition of equivalent business (again for synergies i.e. more sweating). As a hedge fund then I’m after a “rent extraction” machine — “up those license fees, squeeze those costs, return that capital” is the motto! Of course, eventually those companies will run out of runway i.e. there’s no-one else left in the legacy space to acquire or there’s no more cost cutting to be done and the business model will continue to decline. From a hedge fund perspective, this is also fine because you’re also already invested in the future. Shortly before the cracks start to appear in the legacy space then I’d be moving capital out and starting to short. Trebles all round. Tricky. The honest answer is probably none. I’ll come to that “probably” in a moment. Your role is to sweat, return capital and disappear over the horizon — well, that’s the investment view. Let us just say that most founders don’t react well to this. However, as the CEO, you need to realise that you’ve not only got your sales team, employees (with the exception of a few rebels) and customers fighting against your attempts to make a future but if you’re really unlucky then you’ve probably also got savvy hedge fund managers trying to dissuade you of the notion. Your future is one of rent extraction and the cliff, hardly the glorious image that most hope to create. As the CEO, you can try and push back against the hedge fund but they will tend to fight you. As the fund manager then I would have already invested in those new entrants that are building the more certain future with their utility services. Anything you spend is capital that you should be returning to me not gambling on some uncertainty. I’m investing in you to maximise the local conditions and it’s returning dividends that is keeping your share price and your rewards up. Get this wrong and you’ll find the financial markets can themselves be a significant source of inertia to changing direction. From a point of view of the market, this is actually fairly optimal. The legacy is removed whilst the future flourishes. Your role in such a position is one of legacy removal and the market will not reward you for not playing that role. 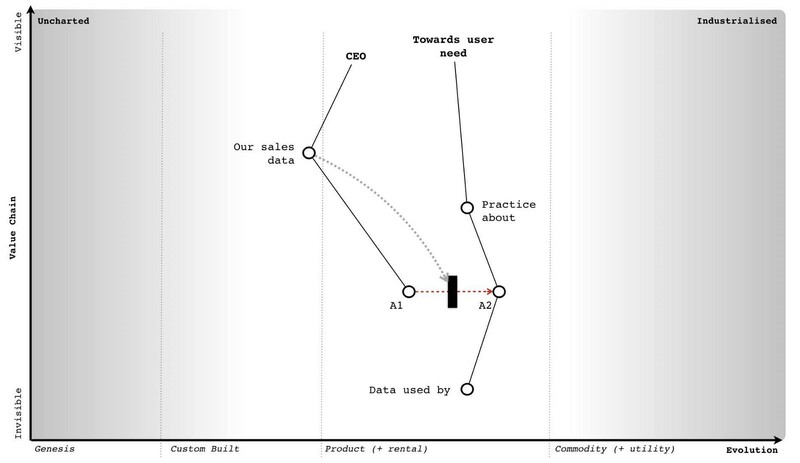 In the first variant (product to product substitution) then as the CEO you’re playing a second curve because it’s the right context specific play. You’re trying to build a new future given a possible substitution of your core product set and an impending future crisis point. You can often achieve this because you have the skills (i.e. capability), process and data to support such efforts. In the second variant (product to utility substitution) then as the CEO you should be playing some form of “sweating” game because it’s the right context specific play. You’re not trying to build a future, not trying to run a second curve but trying to extract as much value as possible before the system collapses. The nature of what you do, your role in the game, changes with context. “What if I want to build a future?”, “I refuse to go quietly!”, “What about the people!” are often phrases I hear especially with founders when we discuss this. Well, you can’t tell employees that the company has no future and so you probably need to play a bit of theatre and paint a picture of one. “That’s dishonest! I want to build an actual future!” are often common replies. Well, there is an upside to playing the game. “Probably none” doesn’t mean none and there is a path though it’s not an easy one. The odds of you achieving a future position without exceptional situational awareness and a culture to match are not great but they are something. Leadership is neither easy nor is it necessarily comfortable. The first advantage of playing along with the role is that you’re buying time. This gives your employees more of a future (which I’m sure they would thank you for) and so as unpalatable as it is (the waves of cost cutting) then consider it a more graceful withdraw for the company from the market. With skill this can easily last a decade a more. However, we can go one step further and create a future assuming we don’t make the grand mistake. This is known as the spiral of death and it is one of the most commonly repeated mistakes in business. It’s also a company killer. Let us assume that the shift from product to utility (what I describe as the “war”) is upon us and we’re in the position of “rent extraction” from a legacy. Capital is already flowing from our industry into new industries whether more evolved utilities or higher order systems that have been created on top of this. We’re watching this marvellous new world forming but we are on the sidelines. The good news is we’re maintaining our position for now through some form of sweating play. You’re going through the fairly difficult time of constantly cutting costs in order to restore profitability and return dividends even though revenue is declining. You may be acquiring and performing more of the same. It’s a tough spot especially when you look at spectacular growth elsewhere. Your problem is the revenue will continue to erode due to evolution in the value chain. 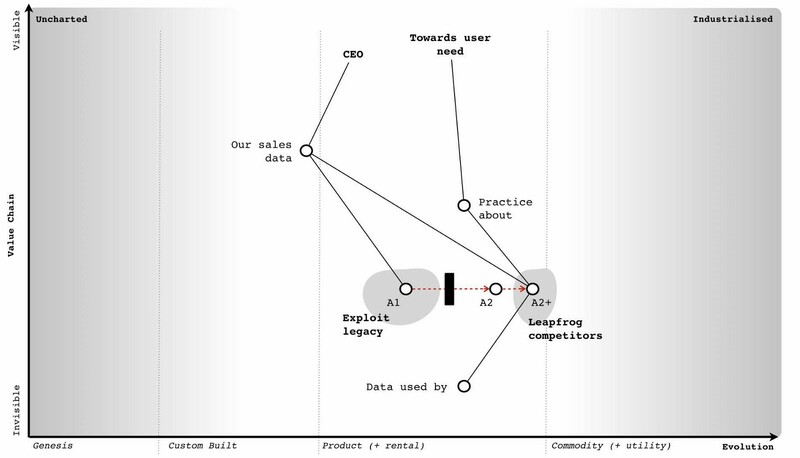 You need to somehow respond by adapting and possibly moving up the value chain despite the resistance and any inertia created by your legacy customers, your sales data and often your own people. But the financial markets are demanding more and you know you’re going to have to cut deeper. It’s a bit miserable but there is a path to the future. The grand mistake is that we tend to cut away exactly the things we need to create that future. In any layoffs for example, it is very easy to use metrics based upon performance in the “past” world and therefore remove those seen as less successful in that previous era. That doesn’t sound too bad but the result is you end up with a higher density of people successful in the past models (which are now in decline due to evolution) and hence you’ll tend to reinforce your cultural inertia to change. Whoops. Unfortunately, we also tend to remove the radicals, the trouble makers and the pioneers. Again, that doesn’t sound to bad because we’ve got to become more “efficient”. Unfortunately, those often annoying people are also the ones most likely to stick a soldering iron into a pot of ink, create inkjet printers and save the company. Whoops again. To compound this even more, we often cut far deeper than we need because we reward those with past success in order to retain them. In our effort to keep the past going we’ve cut away those very things which might give us a future. Our revenue then declines further and the spiral continues. Much of this spiral of death played out in RIM as it attempted to cut costs, return to profitability, reinvent the past and found itself lacking in the capability it needed to create a future. In the most ironic examples, you often hear companies that have undergone aggressive cost cutting talk about their need for talent (often as “the war for talent”) in order to create a future and how they want to transform e.g. “be more like Netflix”. The irony is, if they actually asked Netflix where they got their talent from, they will often point back at the very same companies with the line “we got it from you”. I have sat in that room listening to an executive talking about building a future team like this or that “Silicon Valley” group whilst knowing that the very same team that the executive proclaims as the future was made redundant by the company eighteen months previously. In the worst cases, the very team that was carelessly disposed of cannot now be literally afforded. In one case, I was even asked how much it would cost to rebuild Fotango. With the original team? Today, given that many are millionaires and some run Unicorns? An eye watering sum. So let us assume, that as a canny CEO that you’re not only playing the game to buy time but you’re being careful not to invoke the spiral of death by reinforcing your own inertia and removing the radicals that might save you. What are you playing for? The lucky break. The “sweating” game buys you one thing — time — but don’t waste it. As much as investment companies might want you to return capital, you need to resist this to some extent. A bit of experimentation added with time can sometimes find you the radical route into a brave new world often in an unrelated area. Take IBM today, after 19 consecutive quarters of declining revenue and no let up to the woe then you’d probably conclude they are in a tough spot. They’re betting on Watson (and other initiatives) but at the same time other larger players — Amazon, Google, Microsoft — are circling in that space. It’s tough, it can’t be easy and lots of job cuts have already happened. But cutting costs buys IBM time, it gives it more chance to keep rolling the dice for that lucky break assuming that they’re not cutting away the radicals, the pioneers and the very people who might save them. What might that lucky break be? Who knows, the uncharted space is uncertain which is why you have to experiment. Maybe they’ll turn Watson internally and create the first artificial intelligence CEO — that would probably terrify the strategy consultancy industry. Maybe their future is being acquired and getting squeezed in some grander game to buy time. Oracle? Who knows, the actions of other actors are difficult to determine. All you can hope to do is play for time. If you get your lucky break, you will of course be able to claim that you played the second curve as you build a glorious new future. I’d ask you not to forget that you got lucky but chances are that survivorship bias will overwhelm you and you’ll craft some epic tale to rationalise it all. There’s nothing wrong with being lucky but for whatever reason it doesn’t normally fit the CEO narrative. The desire for magic secrets is fairly compelling and whilst more likely to be honest, the story of success through “pure blind luck” doesn’t fit the bill. That said, using a “sweating” play to buy time in order to maximise your chances to find a lucky path out of trouble is a perfectly reasonable rearguard action. Your goal however is the experimentation and to pray to the fates. Hence the importance of not going around removing the very capabilities that you need to come up with that lucky break. You have to be very careful with where you cut. It’s hardly the more forward thinking, purposeful and deliberate play of a second curve or preparing for the inevitable industrialisation of a space in advance but it gives you a chance. The scenario above concerns substitution, one variant is product to product, one is product to utility. The way you play the game, your role in the game and how you’ll be treated by others are very different. Obviously I’ve simplified the “generalised” scenario because most companies have a diversified set of offerings, so the actual play depends upon your context. It’s also why position and movement are critical i.e. finding yourself in a position of having an entire legacy product set being substituted by a utility is entirely preventable as it can be anticipated. Equally, you should be playing the second curve game when you’re riding high on the product wave and not when things are starting to go south. Unfortunately, you can find yourself at the helm of a company where the decisions that should have been made long ago weren’t and the position is woeful. Your range of options is often curtailed by past bad choices. One of the other saving graces is that situational awareness is not only poor in companies, it also turns out to be poor in investment houses. This might not solve your problem in the product to utility case by creating a future but it can provide a route to selling a bigger story and creating a perception of one. This can buy you even more time as you try to work your way out of the problem. Will the maps help me? Maps unfortunately don’t tell you what to do. They are a means of communication, collaboration and learning patterns. You have to apply thought and find the most probable path to survival and success but there is always the lucky break and its nemesis the Black Swan. That process of decision and the application of thought to a map is wrapped up in your understanding of the landscape, the climatic patterns impacting it, your understanding of gameplay, your role (as perceived by yourself and others) and ultimately choice. There is always an analytical and emotional element to that choice which is why it is so draining. The analytical side will tell you what is likely to happen, where not to invest and where you might invest. However, parts of the map are uncharted (“Ere be Dragons”), parts are uncertain (product to product substitution) and the gameplay of competitors is often unknown. Whilst we know that the industrialisation of one thing (such as electricity) opens up adjacent possibilities of novel higher order systems (e.g. radio, TV, refrigeration blankets) it is not possible to say which one of those will succeed. In the end there is always an element of gut feel and leading the charge. This cannot be removed but neither should it dominate everything. Leading the charge is also important because we have to act. It’s movement which is the key to learning. Without movement, we do not discover, we do not explore, we do not learn and in most cases, we simply die. Maps simply provide a systematic way of learning, of not repeating old mistakes, of applying patterns from one context to another and not blindly marching to your doom along a well trodden path with signs saying “doom, doom, ‘ere be doom”. Of course, you might still decide that this is the best path for you. Maps don’t tell you what to do, they help explain the landscape. With that in mind, I buried several common failures of sensible executives within the Phoenix scenario in the previous chapter. It’s worth going through those now. Do remember, that people aren’t daft. Executives don’t make these mistakes because of a lack of wit. The problem is blindness. If you cannot see the board whether visually or through some mental model then you cannot learn patterns and you are moving in the dark, stumbling from one step to another as though it’s the first step you or anyone else has ever taken down that well trodden path. It may be well sign posted with “doom, doom, ‘ere be doom” and a hundred other companies may have walked along that path and met “doom” but without a map, you’re going to feel it’s an undiscovered path to future success. This is especially true if you’re unfortunate enough to attend that one conference with a CEO talking about how they built a successful company by travelling down that path and it wasn’t “blind luck”. One person’s survivorship bias can be a killer to others. When our existing market is undergoing a shift from product to more commodity (or utility) then there is often the temptation to avoid the problem by selling into a less developed market. This can buy some time but at the cost of increasing inertia to the change that’s needed. You’re actively avoiding the problem and the competitor will not only chow down on your existing market but the one you’re busy helping to create for them. The problem with trying to innovate your way out of a war (i.e. substitution from product to utility) is that the creation of the novel and new is highly uncertain by nature. It’s a gamble. However, this is not what most people actually mean when they talk of innovation. What they’re really saying is we need to “innovate” around our product i.e. “We need to differentiate”. Well, in this case it’s far too easy for the competitor to play a tower and moat game by copying any successful innovation you create for a product. To explain tower and moat, let us switch roles for a moment and become the company that has launched a utility service into a market that is surrounded by products. You occupy the future position and know full well that your competitors will have inertia to the change. They will often react by not only spreading fear, uncertainty and doubt but by trying to differentiate their product offerings with some form of “innovation”. What you do, is copy and add these to your utility service. Your focus is to build up a tower of revenue (your utility service) surrounded by a huge moat devoid of any differential value. The competitors efforts to innovate in a product world end up just enhancing this by helping you to copy and grow the moat. When the competitors finally wake up and make the plunge into our future market then they’re likely to have been delayed because of efforts to differentiate their products with new fangled things (not a good move in a punctuated equilibrium i.e. rapidly changing market) and they will actually have nothing different to offer. This is pretty much a disaster. So, now let us switch back to our role as product player. If our response to a utility provider entering into our market is “innovate” then as long as it’s truly radical and entering a different market and assuming we’re aware that this is a huge gamble then it’s a reasonable move. If it’s “innovation” around a product then I hope you can see by now what’s going to happen. Bad move. “Doom, doom, ‘ere be doom”. Beyond the whole “tower and moat” play then attempts to differentiate a product in a game of utility substitution brings two other dangers. First there is the existing consumers inertia to change which is often represented by a desire to maintain the existing model rather than to adapt. They will encourage you in this differentiation play and it becomes very easy to be seduced by it. The problem is that as their competitors adapt, the pressure on them mounts to adapt (the Red Queen) and though they tell you they want the past, they often end up buying the future. There’s no point in complaining that “this is what the customers said they wanted” as it should be obvious by now that what a customer says they want and what they actually need are often not the same. 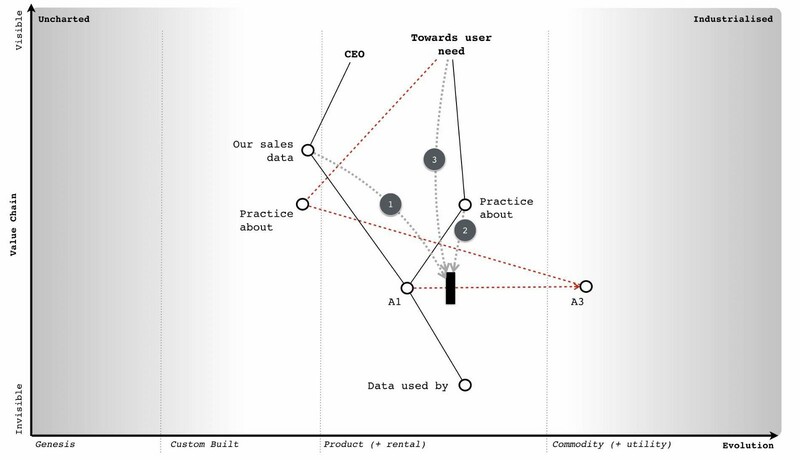 This is also why mapping doesn’t use an anchor of customer want but uses need instead. The second problem depends upon whether your competitor is using some form of ecosystem model. If they’re using an ILC (innovate — leverage — commoditise, see chapter 5) model then their rate of apparent innovation, efficiency and customer focus will all increase with the size of their ecosystem. This means as much as we try to out innovate, we can easily be overwhelmed by their ecosystem. For example, look at Amazon Web Services. When you consider AWS, don’t think of it as going up against a company with a rapidly growing $12bn in revenue and thousands of developers instead you’re taking on the entire AWS ecosystem. You should think of the ecosystem as Amazon’s entire R&D effort and ask, do you really have what it takes? Whilst cost cutting can be useful to prolong the past and buy time, be careful to avoid the spiral of death caused by self-reinforcing inertia. The past is going, you need to accept this. If you’ve been caught in such a legacy position then understand your role. Either you’re heading for the cliff and aiming for a well padded retirement or using this in the hope of a “lucky break” hence you’re buying more time and encouraging experimentation. Price cuts are a perfectly useful form of gameplay but again be careful. Unless you understand the competitor’s value chain then you’re unlikely to know if they have constraints which limit their own price reductions. It’s very easy to get into a game of last man standing with a competitor that has significantly more potential for price reductions than you do. In a time when those core parts of your value chain are evolving to a more industrialised form, then this can often become simply reinforcement of inertia combined with wishful thinking. Core is a transient concept and as such, it changes. All of the above can equally be useful, if applied in the right context. But what has this got to do with the practice of scenario planning? This entire chapter has been all about introducing you to the concept of variants, of different possible scenarios, of different roles, of different contexts and the interplay between them. With this in mind, let us plunge into another scenario. You are the CEO of a small software company with 100 employees. You have been approached by a global conglomerate that is interested in commissioning your company to build them a new service. a microsite for potential customers interested in finding out more about large format printers. The site should provide a link to an online testing application. an online testing application for potential customers to upload an image and have printed on the LFP of their choice. The visitors to the testing application can either be direct (i.e. through marketing) or indirect (i.e. via the microsite). a back-end system to distribute the printed image to the potential customer including a brochure on the LFP used and a follow on sales call. each delivered print will be considered a lead. Because of past bad experiences, the client has moved towards more value based contracts (known as worth based development). They would like you to invest in, build and operate the service and they will pay you $40 for each customer lead delivered. You will retain ownership of any IP related to the service, though there is a clause for exclusive provision to the client for the length of term of the contract which is one year. Sales and marketing feel this is a good project because of the brand name. They’ve examined the LFP market which has a CAGR (compound annual growth rate) of 4.5% with over 310,000 units shipped. Currently the client represents around 15% market share. Though it is considered to have the best LFP products in the space, it has also seen as losing ground due to weak marketing. Sales highlight that if successful then this project could be sold elsewhere, the potential market is significant and it provides a valuable in-road into the client for other projects. Your project management team are keen to try working on an outcome basis. They argue that this is a potential future model which might solve many of the client conflicts they’ve experienced in the past. Gaining experience in such a space seems worthwhile. They’ve looked at the client figures and developed a financial model with systems, development, marketing and finance. Your CFO is cautious and points out that there are some significant downsides if things go wrong. For example, one possible outcome is we end up with a net cash outflow of almost $800k before disposal of any assets. There is unfortunately a complication which the CFO highlights. There are two competing proposals for building our solution. One is to build using in-house infrastructure (a build “in-house” variant), the other is to build using a public code execution environment that provides charging at the functional level based upon consumption of resource (a build “public” variant). The CFO is unconvinced by marketing’s conversion rate from total visitors (i.e. both direct and indirect) of the testing application to leads. Given we’re being paid by the lead, the CFO views this as critical. The CFO agrees that marketing has put together a compelling case of how the service will be a roaring success but highlights that no-one seems willing to provide a probability for each of the outcomes. There is a lot of uncertainty over which of the four will be more likely. In terms of operational cost such as print and distribution, the CFO is more satisfied that we have a good handle on this. The CFO also notes that the in-house solution does return hardware assets that have value after depreciation is considered. These could be disposed of or repurposed but we have a somewhat less than perfect record here. 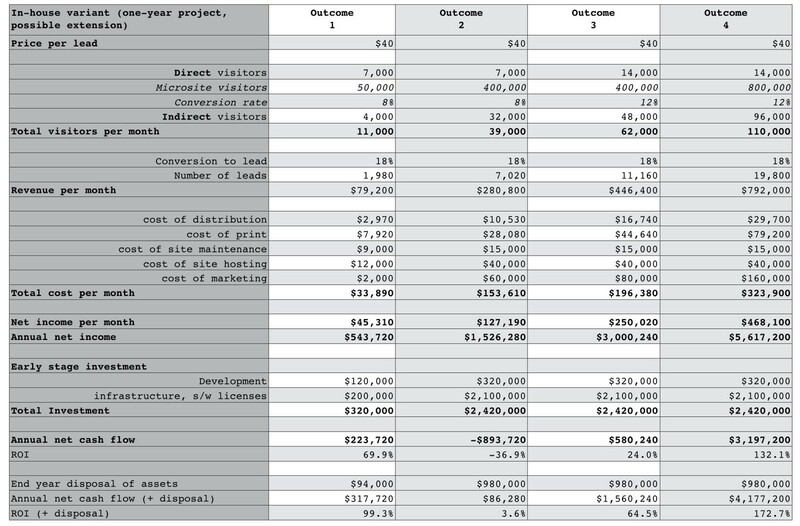 The normal ROI (return on investment) the company expects to make on any project is around 40%. The two variant models (in-house, public) of the scenario, each covering four possible outcomes are provided in figures 195 and 196. 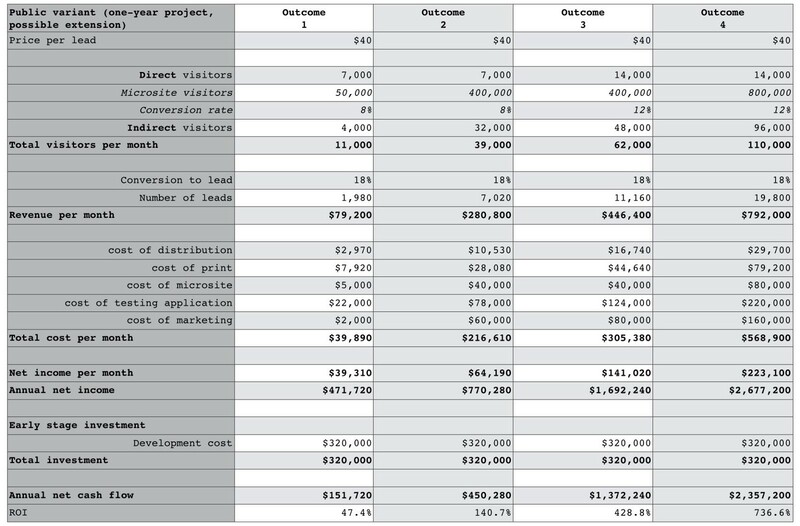 The figures are provided as a “best guess” estimate of the four outcomes. What the actual outcome will be is uncertain. In the “in-house” variant, some disposal figures have been provided for the in-house assets assuming these are not repurposed. Development has also provided a map of the space which covers both the “in-house” and “public” variants. The difference is simply explained as a shift from a more product style of platform (requiring us to build, maintain and operate our own product stack) to a more utility environment. One significant change with this shift is function based billing through which greater transparency, clarity and variability on IT expenditure can be achieved. These environments are relatively new but development believe that building skills in this “serverless” space (the common term used in the market for public code execution platforms despite the obvious existence of servers under the hood) is essential for future competitiveness. 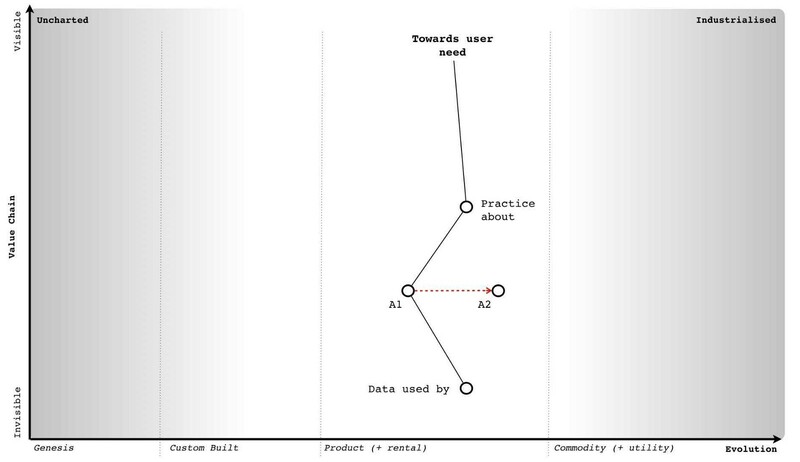 The map is provided in figure 197 with point 1 being the in-house solution and point 2 being the public platform solution. The CFO has marked on various metrics used in the above models. Systems and security both have concerns. Whilst security is concerned over the lack of experience in this space, it also recognises a necessity to develop appropriate skills. Systems highlights that it has ample skills in developing such environments and it can build the environment more effectively than a generalised public provider. There’s a bit of derision about the “serverless” term. The head of systems also says that by embarking on a route of using an untested public service for such a visible and important project then we’re sending a worrying message to the systems team. The board are uncomfortable with this project preferring the more tested routes of contract negotiation that the company has established. However, though not comfortable there is no objection to it. You have the map, the background and the financial models. You need to consider the landscape, the roles involved, your role and what’s the best way to play this game. Once you’ve signed the contract then the company will be taking the risk and paying for an early stage investment. That early stage investment may significantly rise depending upon which outcome starts to emerge. Do you sign the contract or not? If you do sign which variant do you go for (in-house or public)? Are there any other changes that you would make? Chapter 10 — I wasn’t expecting that! This post is provided as Creative commons Attribution-ShareAlike 4.0 International by the original author, Simon Wardley, a researcher for the Leading Edge Forum.